The origin of the Wild Hunt varies from land to land. In some cultures the huntsmen are said to be gods, in others ghosts and in some faerie creatures. Often the leader of the Wild Hunt corresponds to a mythical or historical figure, commonly the Norse god Odin, the Old English folk hero Herne the Hunter or Gwyn ap Nudd, ruler of the Welsh underworld. One aspect of the Wild Hunt legend that is universal is the belief that seeing them brings nothing but misfortune to the beholder – they are viewed as the harbingers of death, plague and destruction. 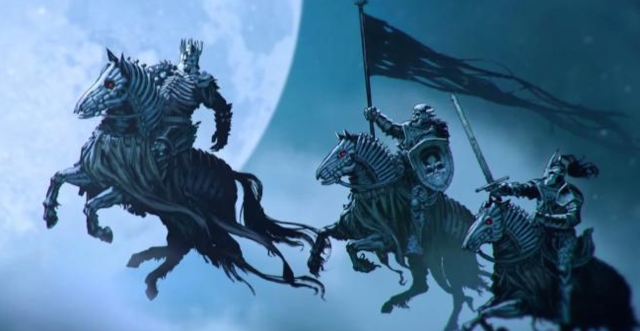 For this reason, folk lock their doors on nights when the Wild Hunt rides or risk being carried off to the land of the dead or worse, being forced to become part of the spectral cavalcade for all time themselves. Such negative associations have earned the Wild Hunt a variety of ill-sounding nicknames, such as Cain’s Hunt, the Devil’s Dandy Dogs and the Hounds of Hell. Despite the ominous nature of the Wild Hunt, many early European peoples ritually re-enacted their spectral ride across the heavens at Yuletide. In England real historical figures, such as St. Guthlac and Hereward the Wake were reported to have participated in the Wild Hunt, which soon became integral to folk custom in this part of the world. Arthurian mythology, which tended to be a mish-mash of the legends of all of the various different cultures and peoples in the British isles, imported the legend of the Wild Hunt and its leader was said to be King Arthur himself. Cadbury Castle in Somerset, an area central to Arthurian mythology because it was the reputed location of Camelot, was one of many locations where on wild winter nights the king and his hounds could be heard hunting the ghosts of the damned. But by no means was the idea of a Yuletide Wild Hunt confined to Britain. Even as far afield as India, a belief in a spectral hunt was widespread – the Hindu holy texts known as the Puranas mention that the god Shiva, mounted on the back of a bull and accompanied by a warrior band of ghosts, hunts the world at this time of year in search of sinners. In Germany the leader of the Wild Hunt is sometimes described as riding a dragon, while in Scandinavia the hunters’ prey is often said to be trolls, elves or dwarves rather than ghosts or spirits. In Spain the Wild Hunt was called the Estadea or Santa Compaña, a company of spectral saints and heroes, who could always be seen followed by a black dog named Urco. This may have been the inspiration for Frankie Laines hit song “Ghost Riders in the Sky. If you don’t know the song, look it up, It is really a good one. Funny you should post this now because I read Hellboy: The Wild Hunt earlier this week and it covered the same ground that your post brings up. That’s a terrific graphic novel! I always learn so much reading your blog posts. I’d never heard of the Wild Hunt and now that I read the article twice (I really did! ), I think it’s time I did some research. It’s fascinating! Thank you! I wonder if the Wild Hunt had some part in the creation of Santa Claus? An almost godlike figure dressed in fur being pulled through the sky by a herd of reindeer. Not your typical saintly transportation. Great article. Interesting stuff! Yes, there are some great story seeds in those old myths! Have a look at Terry Pratchett’s Hogfather. I’ll be reviewing the DVD in a week or two, and may use it for some of my quotation tweets. Hi. Thanks for your kind words about my Christmas Post. There’s always lots of interchange between older legends and practices and Christmas. The Celtic Saints had a great way of ‘blessing’ and gently transforming older ways when they came to England. 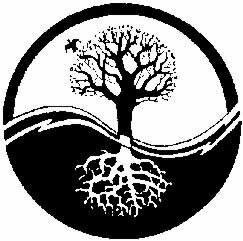 Celtic Christianity is so earthy.